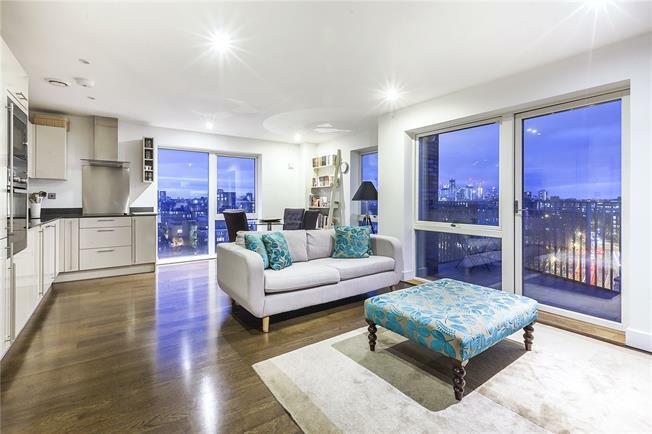 An outstanding two double bedroom apartment with stunning skyline views over The City and Canary Wharf. Situated on the corner of the seventh floor in the prestigious Parker Building, this surprisingly quiet 813 sq/ft space has floor-to-ceiling windows providing beautiful panoramic views, a large open plan kitchen living room leading on to a good sized balcony, perfect for alfresco dining. This immaculately presented apartment has two good sized double bedrooms, both with built in storage, and the master has an en-suite. There is a great sized master bathroom, two storage cupboards and this property also comes with a secure underground parking space. Nearby tube stations include Bermondsey and London Bridge which are on the Jubilee line, serving both Bond Street and Canary Wharf. Many residents take the option of walking across Tower Bridge into the City. A selection of bars and restaurants are found locally at Shad Thames, whilst popular Bermondsey Street, Maltby Street Market and Borough Market are nearby. Other attractions include Southwark and Tanner Street Park.